At Curtain-Tracks we just love hearing from our customers after they have received and installed our products. You see, we are certain we have the best quality out there, and we know there are many creative uses for each of our products, but the warm and fuzzies are endless when someone takes the time to show us what they have created. A big thank you goes out to Jennifer W., who sent us this picture of her lanai. Can you see our products? We can’t either! Isn’t it great?! For those of our readers who have the misfortune of living up north where outdoor living isn’t as appealing for most of the year, a lanai is similar to a patio. You know, that thing that is covered by snow for 60% of the year, and is miserably hot for 30% of the year? A lanai has features such as curtains, fans, or glass walls to help regulate the hot temperature. 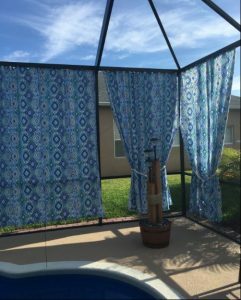 Jennifer’s lanai has beautiful curtains to provide privacy and shade, and they are hung with our products. This space was already framed with black lines, so our 42124 ceiling track in black was an obvious choice. It blends perfectly! In addition, it won’t rust because it is made of anodized aluminum, creating the perfect combination of function and aesthetics. This track does not come with mounting hardware because it does not need it. Simply drill holes through the lightweight product and screw into place. Once the track is mounted to the existing frame, all that’s left is hanging the curtains. Jennifer used our snap tape and snap carriers which were perfect choices for several reasons. The combination of these two products creates a strong seam, which will hold up in the wind and elements outside. Lastly, it won’t be too hard to change out the curtains when they become faded or dated. Just buy an extra few yards of the snap tape and sew it into new fabric. Easy peasy! Even if you live in Ohio where there are only a handful of lanai-worthy days each year, contact us today! We can help you brainstorm a project equally as cool as Jennifer’s.